Far East trading quiet during Chinese New Year. Market cautious due to weak demand, tight profitability and reduced bank credit. Selective buyers creating shortages of excellent-cut (3X, none) diamonds, but prices of lower-quality goods softening due to excess supply. 1 ct. RAPI -0.4% in Jan. Manufacturers maintaining low production as profit margins are squeezed by high rough prices. Letšeng 4Q sales -40% to $42M, average price -43% to $1,259/ct. Belgium 2018 rough imports flat at $10.7B. Pandora 2018 sales flat at $3.5B, profit -13% to $773M. 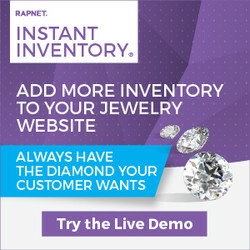 RapNet introduces jewelry to trading network. The Rapaport Group wishes all our friends a happy and successful Chinese New Year. The RapNet Diamond Index (RAPI™) is the average asking price in hundred $/ct. 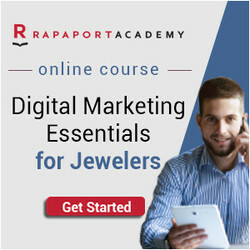 of the 10 percent best priced diamonds, for each of the top 25 quality round diamonds (D-H, IF-VS2, GIA-graded, RapSpec-A3 and better) offered for sale on RapNet - Rapaport Diamond Trading Network. February is a crucial time for Canada’s diamond mines. Located in the most remote region of the country’s frozen Northwest Territories (NWT), Rio Tinto, Dominion Diamond Mines and De Beers have a two-month window to connect their mining operations to the outside world. US restocking slower than expected after holidays. GIA client submitted 2.23-carat, D-color stone for synthetic report. Changes at Ekati mine will reduce availability of the color. Two Lightbox stones have G color and VS clarity. Government replaces 26% duty with two lower rates. Thieves apparently entered safety-deposit room via sewers. Jeweler aims to revive interest in charms. Court awards damages from 31 defendants who operated unlawful sites. National Retail Federation forecasts sales increase of between 3.8% and 4.4%. Revenue grew 35% in third fiscal quarter. Gem Diamonds sees 43% drop in price per carat. Sale is first since nation reformed trade. Production up 24% to 224,947 carats. New feature adds significant value for members. Footage shows man snatching case allegedly worth tens of thousands of dollars. Polished exports flat in 2018 as volume drops. Former deputy head of Israel bourse will serve a three-year term. Pandora (+16%) led retail stocks this past week after investors reacted positively to its restructuring plans. India’s Titan (+6%) gained after strong quarterly results. Mining shares were mixed, with Lucapa Diamond (+11%) up after a successful sale of large stones, while Firestone Diamonds (-11%) fell after unscheduled repair work in November affected its ore-treatment levels. Petra Diamonds (-5%) continued its recent downward trend. © Copyright 2019 Martin Rapaport. All Rights Reserved. 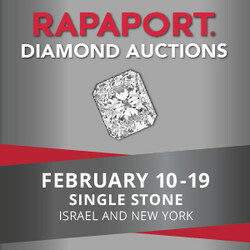 Rapaport®, TradeWire®, RapNet®, Index® and JNS® Jewelry News Service are registered trademarks.